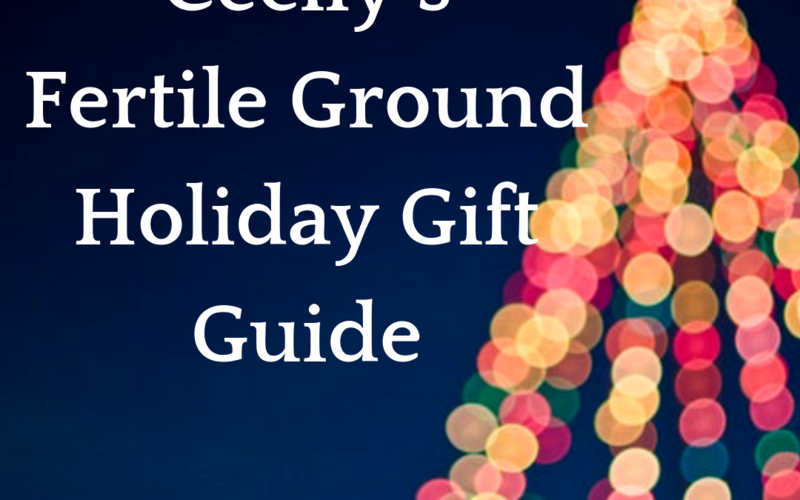 Here are a few ideas for some lovely and uplifting holiday gifts. Happiest of holidays to you! We at Fertile Ground love Basecoat Nail Salons for the wonderful products that do not include hormone disrupters and the incredible service. A gift card from there makes an perfect gift! I’m obsessed with Yllo Beauty’s products containing inflammation-fighting turmeric and other pure and natural ingredients. Not only do these products nourish your skin, they lighten age spots and facial fuzz! Just when you thought it couldn’t get any better, 10% of their profits go to help prevent child marriage. My daughters and I have been using 100 Percent Pure products for years. The makeup is just lovely and colored with natural things like nutmeg, berries and cinnamon and they wear well and look amazing on! They have juicy smelling bath and body products that keep my teen and tween out of the stinky bath places at the mall, and they have some seriously fortifying grown-up skin care products. Their makeup palettes are my favorite, they include eyeshadows, blush and highlighter all in one little rectangular case. The mascaras are make from black tea and chocolate -your lashes will actually smell like chocolate and it stays on all day! They also have amazing sales in the beginning of December! I don’t know how I survived without the Instant Pot! How else can you make a falling-off-the-bone roast in an hour?! We have one at Fertile Ground where we whip up nourishing soup for lunch each week & as a single mom, I can bank on a quick and healthy meal even if I forget to plan ahead. Amazing gift idea!! See my blog on the dangers of plastics in your kitchen & grab a set of these for someone you love! Hands down, the best book on sleep out there! Shawn Stevenson has truly done his homework and written the most comprehensive guide to getting the sleep you need for better health. Buy a copy for you and a loved one! I recommend this book to my patients that are interested in the WHY of eating well. This is a great gift for anyone who wants a deep dive into what our bodies actually do with the foods we eat. It is an amazing resource and guide for figuring out what and how to eat for optimal nutrition. After Max Lugavere’s mother began to exhibit signs of dementia, he made it his life’s mission to research why and teach others how to prevent decline in brain function. His research is impeccable and his writing is engaging and easy to follow. This is a wonderful gift for anyone wishing to upgrade their overall health and brain health! In a time when there is a new diet craze every month on the internet, this book is here to help. The why and the how of optimal eating are included in this wonderful book by the incredible Mark Hyman who has dedicated his life to helping others live in healthier bodies! Dr. Jade Teta has dedicated his life to helping others find their optimal health. He is a master of metabolism and exercise and has used his extensive knowledge of the body and endocrine system to help support many into decoding their unique metabolic balance. His new book Next Level Tribe, is about inner balance and connecting with others by taking care of your internal health. This beautiful book, co-written with Danny Coleman, makes a lovely gift for almost anyone on your list as it guides the reader towards better boundaries and improved connection with others. Pick up a copy for you as well! The Calpak 20” spinner is wonderfully organize, durable and beautiful way to travel. I Love the gorgeous colors! These OEE inserts are wonderful for organizing everything and maximizing luggage space. Best neck pillow ever! It adjusts to whatever position you need with a bendable core, sooo comfortable!